Know that this map is missing some more routes between flags, but wasn't sure how to put them in..
More interested in feedback on lighting/textures and architecture than playability on this on to be honest. Only made for a small no. or players on each team, have experimented with waypoints this time for bots, think its worked ok? The attempt of this map to make a good ctf map feels right. Although how it turned out seems less good. 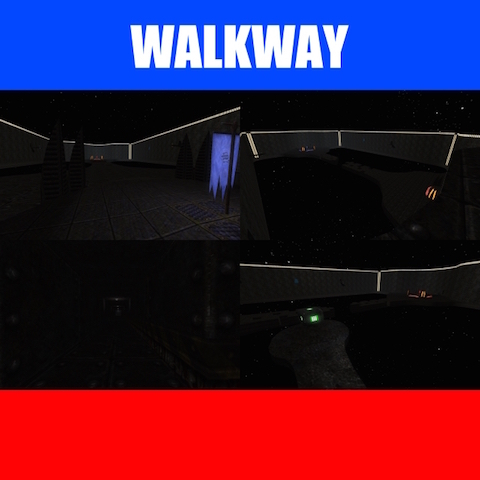 The name may be "walkway", that doesn't mean the flow and gameplay should be exactly like that; straight forward. I advice you to read the Flow and Layout Guide and try again. I can see what u mean, and considered putting more routes in, however I am more concerned on the architecture, textures, lights, and if the waypoints worked with this map.. - i intended it as a quick tester for a bigger map I am making. If you are interested in architecture, a good example of it is tempest (Its in sauer). cphills and votivchurch are also, very good examples of architecture, and vampiscratch 1 and 2 (Those are in quadropolis). You should first learn and open your mind watching carefully with outline (press 7 in editmode) all those maps, all the details and buildings, and try to recreate them, or making something similar. I cant help you more than giving you a method to improve your skills.